Dutch superyacht yard Royal Huisman has significantly expanded the capacity of its refit division Huisfit by securing exclusive use of the deep-water facilities at Emden Dockyard in north west Germany. The new refit location measures more than 300,000 metres square and also includes several covered refit halls, docks measuring up to 218 metres long, and tower cranes with lifting capacities of up to 45 tonnes. Royal Huisman’s key criteria for finding a new location included close proximity to the Dutch border, exceptionally comprehensive facilities, non-tidal access and complete exclusivity. 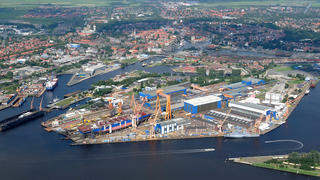 Emden Dockyard was chosen as the ideal solution, and the yard has an impressive history to commend it. Founded in 1903, it has previously been used as a base for the German shipbuilders Thyssen Krupp and Blohm + Voss. The Emden deal doubles the number of permanent Huisfit locations and increases its maximum length capability by more than 100 metres. The yard’s existing Vollenhove facility currently has a maximum length of 81 metres. Notable superyachts to have been refitted by the Royal Huisman team include some of the world’s largest sailing yachts, such as 82.6 metre Lürssen schooner Eos, while current refit projects include_ _Surama, Antares, Gliss and the Claasen-built Heartbeat. Four new-build projects are also under development at the Dutch yard, including the 81 metre sailing yacht Project 400, which is due to be delivered to an Asian owner in 2020.